Let it be known that there are Thousdands upon Thousands of different Size and Shaped Hooks on the Market. Here at Rhine Valley Game Calls I have choosen a few of the most popular Hooks that my Trotline Fisherman (Women) are using. This doesn't mean we won't get them if you need them, it is just a matter of having an overstock of hooks that might not get used. Eagle Claw Circle Sea Kirbed Offset 12/0 Hook. Eagle Claw O'Shaughnessy 7/0 Stainless Sttel Hook. 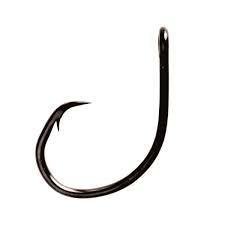 VMC Tournament Circle Hook in either 11/0 or 12/0. Gamakatsu Octopus SE 4X Strong Hook. Available in either 7/0 or 8/0 Size.